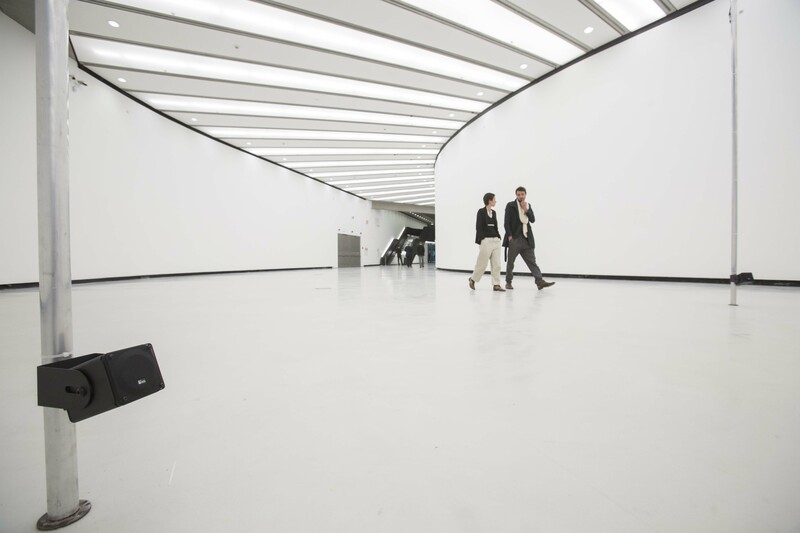 For the period of the exhibition Open Museum, Open City, MAXXI emptied out its museum so that it can be filled with sound. Filling its spaces will be the site-specific installations of Justin Bennett, Cevdet Erek, Lara Favaretto, Francesco Fonassi, Bill Fontana, Jean-Baptiste Ganne, Ryoji Ikeda, Haroon Mirza, Philippe Rahm and RAM radioartemobile, which will transform the museum time after time into an urban, intimate, spiritual, political environment, thereby also redefining its meaning as a public institution. For the occasion of the exhibition Justin Bennett developed two new works: Hyperforum and Oracle 2.0, the latter being an second version of an earlier work, adapted to the site specificity of the hosting city of Rome. A contemporary divining instrument, a device that gathers and dispenses premonitions, suggestions, instructions, points of view: this is Oracle 2.0. The quotes are collected by consulting the texts of Confucius, Cicero, Seneca but also by drawing from the contemporary universe comprising urban references or ones taken from the works of directors such as Jean Luc Godard and David Lynch. With this work the artist seems to respond to human beings’ ancestral desire to know their future. Sit down and wait, If you’re lucky, the oracle will speak to you. By combining the sounds of the activities in the public spaces along with the environmental sounds, Justin Bennett defines the identity of a space and the perception that we generally have of a place. For his second work for the show, Hyperforum, Justin Bennett has created a sound cube that transforms a part of Gallery 1 into an urban plaza consisting of an archive of recordings made in Rome as well as in other cities in which the artist has worked. 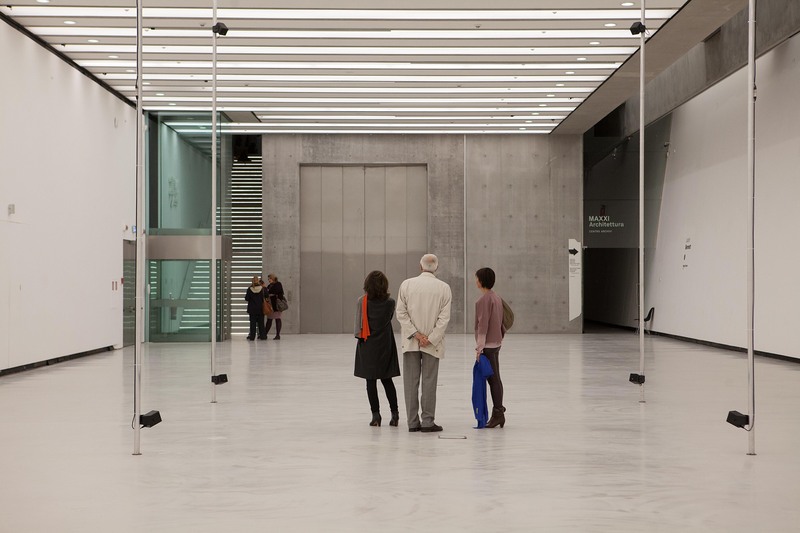 Urban sounds are thus transported from the outside to the inside of the museum, and visitors find themselves in a sonic space in which the volume of the recordings respects that of the original ones, so as to generate a credible parallel reality. In the project Open Museum, Open City sounds reinvent the physical and psychological spaces of the museum with a view to examining the universal themes that accompany the spectator-listener along the display path: A: l’origine (del cosmo); Natura, libertà o limite? ; La città, lì fuori, qui dentro; Surfing the digital wave; Musica: costruire lo spazio; Il guerriero solitario; Rivelazione; L’insurrezione che verrà and Come together. Through both live and recorded sounds, generated by analogical or digital technology, of urban, natural, human, mechanical, and textual origins, the installations both communicate emotions and imaginaries and contribute to reshaping MAXXI’s architecture, creating connections between the inside and the outside, between the institution and the city, between the artistic world and the other communities. An integral and essential part of the project are the events that take place for the duration of the exhibition: performances, videos and photography, theater, dance, music, cinema, storytelling, conferences and debates, linked to the various themes, which witness the participation of artists, architects, intellectuals and, of course, the public. Thus is born a platform for the experimentation of new ideas, a workshop for a democratic and innovative life, in which viewers are no longer merely passive observers, but active participants, as well. More information about the exhibition: Fondazione MAXXI, Rome.